Is Britain ready for the Hop invasion? Do we even like them!? Something happened last night while I was at The Adelphi in Leeds having a farewell drink with an old friend that's moving down to London (isn't everybody?). It got me thinking about the popularity of big hop flavours and aromas in beer, namely beers with big bitterness and a pronounced pithy hop profile. Just to set the scene this a traditional looking pub but one that has a lot of good world beers, decent real ales, and a few well known American Craft beers. It's popular with a few older "Real Ale Regulars" who mix happily amongst what I'll call the "Premium Lager Twentysomethings". I like the pub, and in fact gave it an "honourable mention" not long ago in a blog about good places for food and beer in Leeds. "Could I have a pint of the White Shield please mate?" "Have you had it before?" "Erm yeah, but only in bottles, why?" "We've had a few people complain about it. Do you want to try it first?" At this point I'm thinking the conditionings off or it was just a bad batch but thought I'd give it a try. I know better than to go ahead and order a pint after being asked if I'd like to try it first. So the barman pulled me a small measure and passed it over. Ok so, hmm, Smells ok? Give it a taste and... wow. It had everything that I'd enjoyed about the bottled White Shield, and more. The very fine almost champagne like mouthfeel and carbonation of the bottled brew had been smoothed out with cask conditioning, and was absolutely spot on, not as lively as the bottle, but for me personally was perfectly carbonated. The dense, slightly sweet malt base was bigger, more enhanced, sharper, clearer. Again, perfect. Then the next part was something I didn't expect from a cask IPA, the hops were much more pronounced than in the bottled version. They were huge, bitter, juicy and aromatic. It was absolutely stunning. So somewhat bemused I handed the little taster tumbler (do they have a proper name?) back to the barman and our exchange continued. "It tastes absolutely fine to me mate. To be honest, it's spot on, it tastes better than the bottles I've had. I'll have a pint." "Ok no problem. Only reason I asked if you wanted to try it is we've had a few of the regulars complaining that it's too bitter. I mean it's quite tart if you haven't had it before." We carried on chatting for a minute or so as he pulled the pints and I paid. Essentially the aforementioned Real Ale Regulars had ordered a few pints and complained it was "off" and tasted "sour", and a few of the younger lads had diverted from a pint of Peroni and given it a go but thought it tasted "weird". NB: I might not have the most experienced palate in the world but I know what White Shield tastes like, I know what a bad cask tastes like, and I know that this beer was spot on. It was simply the big hop profile that was putting off the local drinkers. This beer tasted exactly as an IPA should do but both the Premium Lager Twentysomethings and the Real Ale Regulars hated it - and it got me thinking... Do British drinkers actually like hoppy beers? Are they ready for an invasion of big IPA's? Or is it just us beer geeks who are into it? I've heard people say on the beer blogosphere that heavy hopped IPA's are becoming so popular they will soon penetrate the mainstream market and become as commonplace as Pilsners. I never quite believed this, but last night really brought my thoughts in to focus on the matter. The most popular mainstream beers don't have big hop profiles, and from this experience it seems that these Real Ale Regulars weren't fans either. I'd sort of assumed that "cask drinkers" would be getting into bigger hopped beers and American IPA's like the rest of us, but are they? I'd love to know everyones thoughts on this one. It's weird to think of White Shield as something new to the UK beer market, but I guess that's what it is to the RARs. And like anything new it's likely to be divisive: some will discover their latent hophead while others will add it to the book of evidence that Beer's Not As Good As It Used To Be. Don't underestimate peer pressure either. There's a fair chance you might catch one or two of those regulars sneaking a pint of White Shield in when his mouthier mates aren't there too. The funny thing is that by my standards this wasnt a super hoppy beer, it was a really well balanced IPA. I do think hops are something that take some getting used to. I feel as though hops are like chillies - you keep upping your threshold the more you have! Also have a go at the worlds hottest curry. Indian foods fans are only looking for more chilli. What do you mean cookie? 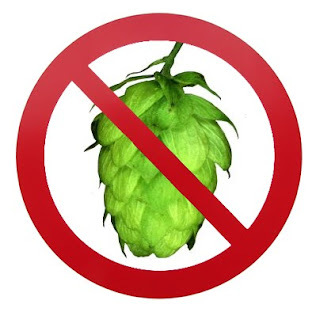 I just meant I think people build up a tolerence to Hops, and once they get the taste for them are always looking for hoppier and hoppier beer! It's a viscious cycle, just like my obsession with chilli heat.